Do you keep a stapler on your desk? How often do you use it? What about the other objects taking up real estate on your desk? 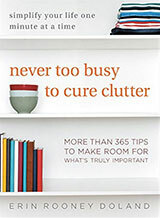 How many items could live in desk drawers or cupboards instead of on your work surface? If the top of your desk is cluttered, start by looking at all of the equipment, peripherals, and doo-dads occupying space and decide if some of the objects could find better homes someplace else. 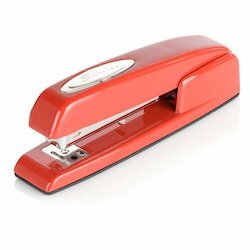 I started this post by mentioning the stapler because most people don’t use them on a regular basis. Paper clips, photocopiers that staple documents automatically, and double-sided printing have reduced the amount of stapling people do at their desks. Clearing the stapler — or broken printer or obsolete Rolodex or whatever you are not using on a daily basis — off of your desk and storing it in a desk drawer is a simple way to give yourself more work space. Except the broken printer… feel free to get rid of that altogether! You don’t have to make your desk sparse and uninviting, but giving yourself room to move can help boost your productivity by clearing distractions and frustrations from your line of sight. Are there objects on your desk that don’t belong to you? Do you have a small collection of dirty coffee cups and used utensils? 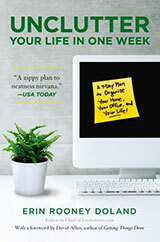 What can you do right now to clear the clutter and create a more useful work environment? I personally keep my stapler on my desk as I use it several times a day. As far as other “desk real estate” – I keep things that I use every day on my desk. I’ve seen other posts on this site that say you don’t need your pencil cup or paper clip holder on your desk. BUT I believe that what stays on the desk is more of a “to each his own” thing. While I use my stapler and paper clip cups every day, someone else may not. Really, the “desk real estate” quandary is this: What’s on your desk that you AREN’T using? Because if you don’t use it several times a day, then it doesn’t need to be on your desk. But if you use something daily, even if someone else might consider it clutter (like a stapler or pencil cup), it’s worth the “real estate” of your desk. You took my red stapler. Yes – my stapler, pencil cup, tape dispenser, and paper clip cup are on my desk at all times. When I moved into my new house, I bought two IKEA desks and positioned them in a “L” shape. Great workspace – no desk drawers. I have thought about purchasing a cabinet for underneath but I think that would limit my sliding ability to go from one work area to another. I have divided up my “L” into 2 quadrants – one is my computer work area with my laptop and the other is my work area with the pens, staples, etc. I must confess that I am still working with the space and fiddling around with what is the most efficient setup. As long as it’s neatly organized and somewhat out of the way, I think it’s fine for these things to be on the desk. For me, it’s more of a time-waster to have to get the stapler, paper clips, etc. out of the drawer when I need than to ‘work around’ it on my desk. I keep everything in a desk drawer. I considered one of those spinning caddies that holds it all in one spot, but didn’t like the aesthetics of it or thinking about dust in the crevices. I like a minimalist desk. Stapler and rulers on the desk; paper clips, pens, tape, etc. in the drawer. Like Rue, I use my stapler and rulers throughout the day. Tape; not so much! The stapler and tape dispenser are on my husband’s desk (we share a home office). The paper clips are on my desk. My desk has room for a Mug Master full of useful tools, a radiometer, my coffee mug and a pink wooly mammoth. Anyone can have a pink elephant. Two staplers live in my top desk drawer, and to be honest, I never use them. But my students do, sometimes if I hand out printed worksheets – and not often as I put their work up on line, they will go and get a stapler out of the drawer. I actually did that recently–took a whole bunch of stuff I don’t use often (including my stapler) off my desk and made drawer space for it. It really is nice to have the extra workspace. At the office, I have my phone, stapler (yes, I use fairly frequently–paper clips drive me crazy b/c they’re always catching other stuff), a little dish where I throw random stuff, my card holder, a few pictures, 2 cups of pens, monitor, and lamp…and paper. Lots of paper. My desktop holds the stapler and pencil cup which I use constantly. I also have the stacks of paper the other Deb above has notes. I am a very visual person. I also tend to keep books and binders here to remind me of things I intend to do. I have an activity book whose title constantly reminds me of some of my goals while planning lessons. I also have a geneology book that reminds me of my goal to get the family data in shape in time for a gift I am working on. The check record binder is always in my view so I don’t forget to attend to financial records. I have my scanner here to remind me of the project of digitizing my old photos. You can see I am still in the Dark Ages when it comes to online bill-paying and computer calendars. Having these things cluttering up my desk is another way of reminding me to get started on THAT project! Until about 6 months ago, I kept my stapler on my desk and used it about 50 times a day. Then my workflow changed drastically and it went down to about once a week. Still, it took until about a month ago for me to move the stapler to a drawer. Last week, I moved the stapler to a different workspace where we need a stapler more often, to replace the old barely-working one which was there. I haven’t missed it, and I figure crossing the room to staple something once a week is worth the drawer space I’ve gained. In my counseling office and in my home office, I keep the stapler in the top drawer so it’s not taking up space and creating visual clutter. But I use it frequently enough for progress notes that I need it handy. my office real estate is small so the desk stays free of all but the laptop and lamp. Small endtable by the desk serves as a return and keeps supplies I use with regularity- tape, stapler, phone on top shelf, pens/postits/supplies on bottom shelf. Handy, orderly, works for me. This post made me think about my desk in a different way. It has no drawers, just a keyboard pullout and monitor stand. I always assumed I NEEDED everything on the desk, otherwise it wouldn’t be on the desk…So I spent about fifteen minutes (including dusting) taking things off the desk. I put things that belonged elsewhere away, and stuff I don’t use regularly (including the stapler and box of extra staples) in a wooden wine box with a hinged lid. I tucked it under the desk so I can grab what I need quickly. I can actually see and use my desk calendar now! Thanks for the inspiration. A lot of stuff that I *do* use daily goes into my desk drawer, at home and at work. On my work desk are my computers and associated paraphenalia (sp? ), phone, little post-it pad, scratch pad, tissues, hand sanitizer, the books that don’t fit in the bookcase, non-fridge snacks for the day, and piles of paper. Everything else is in a drawer, even things I use daily like pens (put away at the end of the day or they grow legs) or pinned on the bulletin board. My stash of snacks is in the deep file drawer. At home my desk has even less: computer, one short vertical file, pen cup for the half dozen implements I use frequently, scratch pad for lists, coaster, speaker phone. All the other little stuff is in the top drawer. The layout has remained the same for [cough] years, I will no longer buy a desk that doesn’t fit the plastic drawer organizer I use, and I can find everything in there blindfolded. I have a ton of stuff in the two office drawers, the deep office drawer, the printer table, the short bookcase, and the surfaces on which I put the piles of papers, but the desktop itself is always empty except for the pile of paper I’m working on right then. All great ideas. I work from home and until recently tolerated many “little annoyances” instead of doing something about them. I finally decided to tackle the problems. My stapler was one of them. It was so hard to use it hurt my hand. I replaced it with a small battery operated one. Instead of wincing with pain it’s kind of fun to use! It staples more sheets, too. Now, if only I could find a place to hide my afternoon snacks (think chocolate) from my son! Back in the day, someone made a small office tool cube. it’s black with multi-color flush fitting tool compartments. It’s 2-7/8″ cubed measurement. I’d like to get another one but they don’t seem to be made anymore.